Martin Henry Renken immigrated to the United States in 1872 and in 1888 he founded a dairy on Park Avenue and Spencer Street in Brooklyn. At the start the dairy had only one route that was served by a single horse and wagon driven by Renken. By 1896 the business had moved to 864 Bedford Avenue and was called the Bedford Dairy. Around this time the company established it’s first creamery in upstate New York where milk was received from area farmers and shipped, on a train car refrigerated with ice to Hoboken. In Hoboken it was picked up by wagon, ferried across the Hudson River and taken to the dairy via the Brooklyn Bridge. By 1903, the business had begun to purchase property on the Myrtle/Classon block and had moved their offices to 204 Classon Avenue. A year later, in 1904, it was listed as the M H Renken Dairy as well as the Bedford Dairy. Around this time, the company had one wholesale route and ten delivery routes. In addition, they had added a distribution center in Borough Park and several more creameries in upstate New York and Pennsylvania. The business incorporated in 1912 as the M H Renken Dairy Co. By 1914, the company continued to expand and had moved their offices to 131 Emerson Place (the address embossed on one of the bottles I found). 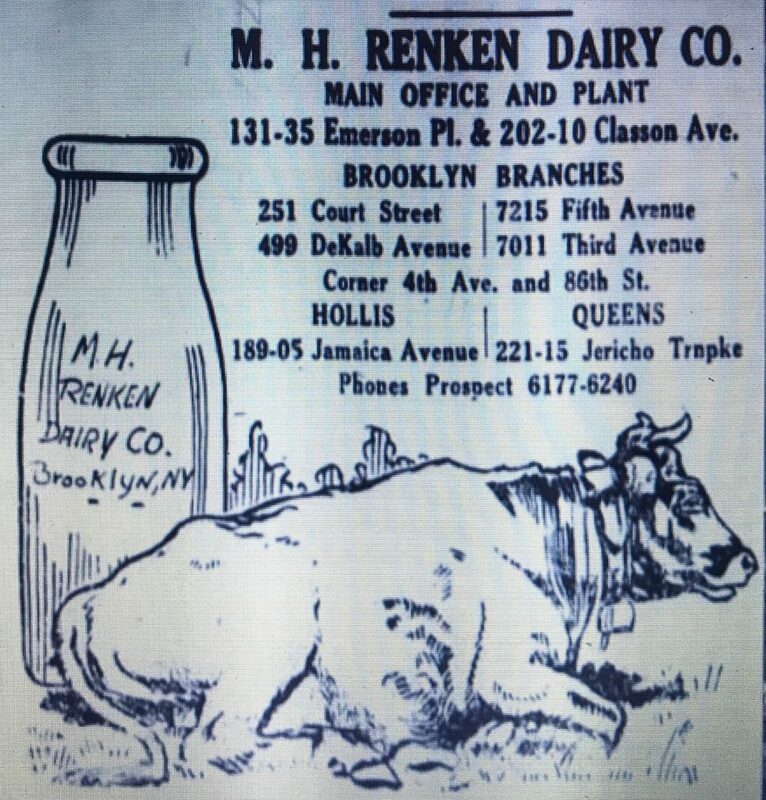 Less than ten years later, in a May 16, 1923 advertisement Renken listed seven branches in addition to the Emerson Place plant, five in Brooklyn and two in Queens. By 1930 they were expanding into Long Island where they opened a new distribution center in Rockville Centre that supported a completely motorized delivery fleet. 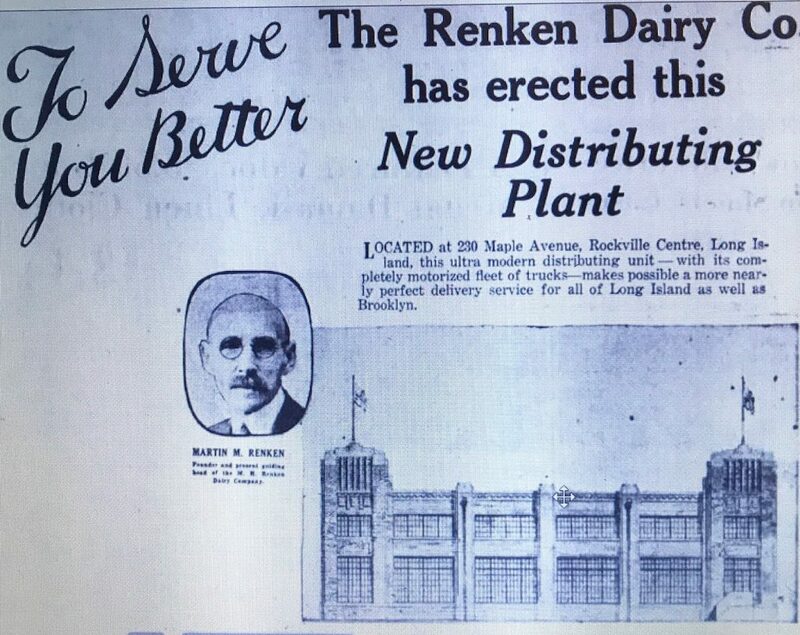 At this point Renken was NYC’s largest “independent” dairy, behind national conglomerates Borden and Sheffield Farms. In 1934, Martin Renken died and was succeeded by his son, Henry as President. At this time, the company was at its peak, operating about 300 delivery routes and employing over 600 people. By this time the business had a subsidiary called United Creameries that I’m guessing encompassed their rural facilities in upstate NY and Pennsylvania. A 1930 advertisement mentioned 12 upstate New York creameries in Orange, Herkimer, Steuben and Tioga counties alone. 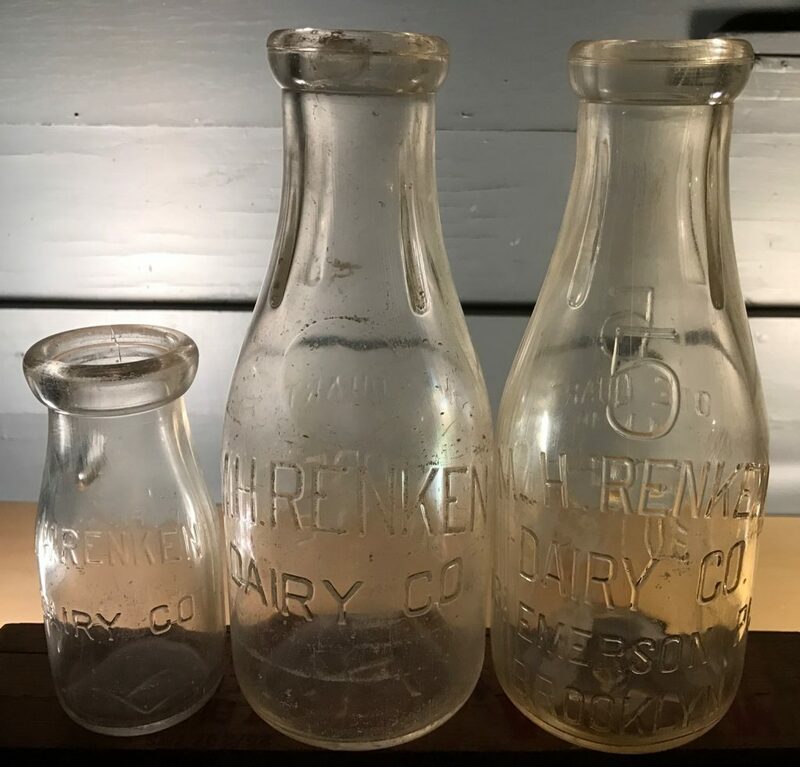 In 1938, Renken was bottling over seven million quarts of milk a year, all pasteurized and bottled at the Myrtle/Classon complex. In the 1950’s Renken began to succumb to the trend away from home milk delivery and toward the suburbanization of dairy processing and packaging and by 1959 it shut down milk processing at its main plant. At the time, Renken was still delivering and markrting milk under their name but Sealtest Dairy had taken over the processing. In 1965 Elmhurst Milk and Cream Company took over the processing and local delivery routes, leaving Renken with just wholesale deliveries. Finally, Renken was sold to Beyer Farms in 1986 and the Renken label was discontinued several years later. I found 2 quart bottles and one half-pint bottle. One of the quart bottles has the 181 Emerson Pl. address embossed on it. The bottles appear to have been made in the late 20’s to mid 30’s based on numbered codes at the base. This dates them in and around the peak period of the business. Next Next post: High-Ground Dairy Co., Brooklyn, N.Y.